Goldstein, Joseph, and Jack Kornfield. 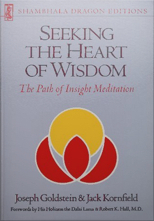 Seeking the Heart of Wisdom: The Path of Insight Meditation (Boston: Shambhala, 1987). A rare blending of wisdom and practicality, presenting the keys to meditation and the practice of mindfulness, by two cofounders of the Insight Meditation Society in Barre, MA.